<h2>Science advisers need to explain the evidence – EU research commissioner</h2><br /><p>It comes as people are more and more able to access contradictory information at the touch of a button, and there is growing public mistrust of experts.</p> <p>Speaking at a conference about government science advice, entitled Science and Policy Making: towards a new dialogue, which took place on 29 and 30 September, Commissioner Moedas said that the public would only accept scientific advice if they understood the process by which it was collected and given.<br /> <div class="quote-view quotesBlock quote_vertical_right"> <div class="quotesTop"><img src="https://horizon-magazine.eu/sites/all/themes/horizon/images/quotes_top.png" alt="" title="" /></div> <p>‘We need to say that facts do matter.’</p> <blockquote><p>Mairead McGuinness, Vice-President, European Parliament</p></blockquote> <div class="quotesBottom"><img src="https://horizon-magazine.eu/sites/all/themes/horizon/images/quotes_bottom.png" alt="" title="" /></div> </div> </p> <p>‘People are no longer willing to accept scientific advice on trust,’ he said. ‘Scientific advice must go a step further and explain the evidence base. It must also bring different perspectives from social sciences, from arts and humanities, from big data. It must connect the dots.’</p> <p>Later this month, the EU’s high-level group of scientific advisers, an expert group of seven independent scientists which was set up in late 2015 to provide advice to EU policymakers as part of its&nbsp;<span>Scientific Advice Mechanism (SAM)</span>, is due to give its first recommendation.&nbsp;<span style="font-size: 13.008px;">The group has been looking at ways to close the gap between light-duty vehicle CO2 emissions levels in laboratory testing and in real life</span><span style="font-size: 13.008px;">.</span></p> <p>Commissioner Moedas said the most effective way to deliver science advice is to find the best expertise and explain it to people and politicians in a way that they can understand.</p> <p>‘We speak two very different languages, the language of science and the language of politics,’ he said. ‘And a big, big challenge for a scientific adviser is to transform that language of science into the language of politics.’</p> <p><strong>Identify problems</strong></p> <p>Tibor Navracsics, European Commissioner for Education, Culture, Youth and Sport, told the conference that scientific advice is crucial not only to come up with solutions, but also to identify the problems in the first place.</p> <p>‘Politicians around the world are faced with an unprecedented set of complex societal challenges,’ he said. ‘Issues like climate change, energy security and feeding the planet cross countries, scientific disciplines and government department boundaries. Evidence is crucial to identify the problem, compare options, and evaluate what works.’</p> <p><img src="/sites/default/files/Navracsics%20at%20Science%20Advice%20Conference_crop.jpg" alt="Tibor Navracsics, European Commissioner for Education, Culture, Youth and Sport, believes scientific advice is necessary to identify the problems we face. Image courtesy of the European Union/ Jennifer Jacquemart, 2016" title="Tibor Navracsics, European Commissioner for Education, Culture, Youth and Sport, believes scientific advice is necessary to identify the problems we face. Image courtesy of the European Union/ Jennifer Jacquemart, 2016" width="582" height="288" class="@aligncenter@" /></p> <p>He said that politics is driven by values and finding the right balance between reason and emotion is becoming more difficult, but that scientists can help politicians by listening to what they need and providing relevant facts at the right time in ways that non-scientists can understand.</p> <p>‘(Scientists need to) understand the constraints of democracy. Facts alone should not determine policies. After all, science can only tell us what is, not what ought to be. In a democracy, people’s values will always take priority over evidence in the final analysis.’</p> <p>Sir Peter Gluckman, chief scientific adviser to the prime minister of New Zealand and chair of the International Network for Government Science Advice (INGSA), pointed out that scientists are also operating in a far more complex environment than in the past.</p> <p>‘Science is now dealing with issues which some have called post-normal science,’ he said. ‘Issues where the science is incomplete, it will always be incomplete, it’s complicated, the stakes are high, decision-making by society is high and the values in which the science is interacting can be in dispute.’</p> <p>Mairead McGuiness, Vice-President of the European Parliament responsible for the science and technology options assessment (STOA) panel, who addressed the conference via video, said that scientists need to understand that policymakers won’t always rely on scientific advice.</p> <p>‘(Science advice) doesn’t mean that policymakers will do exactly what scientists are saying to them but … policymakers like myself need to understand the science behind each area so that we make better legislation.’</p> <p><strong>Post-factual </strong></p> <p>The conference, which was organised by the European Commission and INGSA, discussed how scientific advice could be brought into policymaking in a society that some commentators have described as ‘post-factual’.</p> <p>One example given of where public opinion is out of step with mainstream scientific advice is vaccinations. A recent <a href="http://www3.imperial.ac.uk/newsandeventspggrp/imperialcollege/newssummary/news_9-9-2016-14-58-27" target="_blank">study</a> from Imperial College London, UK, shows that Europe is the most sceptical region in the world when it comes to vaccines and 41 % of people in France disagree with the statement that vaccines are safe, whereas the consensus among medical researchers is that they are safe.</p> <p>The European Parliament’s McGuiness said that it is important to push back against the idea of the so-called post-factual society.</p> <p>‘We need to say that facts do matter, that knowledge grounded in research and produced as evidence very much matters in this house and in parliaments around the world so that we can make the right legislation.’<br /> <div class="moreInfoBlock"> <h3>Lifetime award for research Director-General</h3> <p><span style="font-size: 13.008px;">Robert-Jan Smits, Director-General for Research and Innovation, has been awarded the first EuroScience lifetime achievement award for science and society.</span></p> <p>Dr Peter Tindemans, secretary general of EuroScience, who presented the award at the science and policymaking conference, highlighted four areas where Smits had played a major role: engaging the European Investment Bank in science and innovation, strengthening the link with structural funds to create dynamic regions of knowledge, supporting the European Research Council, and keeping European research infrastructures on the agenda.</p> <p>‘I am very honoured that I am the first one that receives this recognition,’ said Smits. ‘I have been fortunate to have worked with some of the very best commissioners who have enabled me to deploy my creativity and energy to the benefit of European science.’</p> <p>EuroScience, a grassroots organisation set up in 1997 to be a voice for scientists, set up the awards to recognise individuals who have made a major impact on European science.</p> </div> </p> <br /> <img src=”http://www.google-analytics.com/collect?v=1&tid=UA-40077089-1&cid=science-advisers-need-to-explain-the-evidence-–-eu-research-commissioner&t=event&ec=republish&ea=read&el=science-advisers-need-to-explain-the-evidence-–-eu-research-commissioner&cs=republish&cm=republish&cn=republish&cm1=1" /> This post <a href="https://horizon-magazine.eu/article/science-advisers-need-explain-evidence-eu-research-commissioner.html">Science advisers need to explain the evidence – EU research commissioner</a> was originally published on <a href="https://horizon-magazine.eu/">Horizon: the EU Research &amp; Innovation magazine | European Commission</a>. 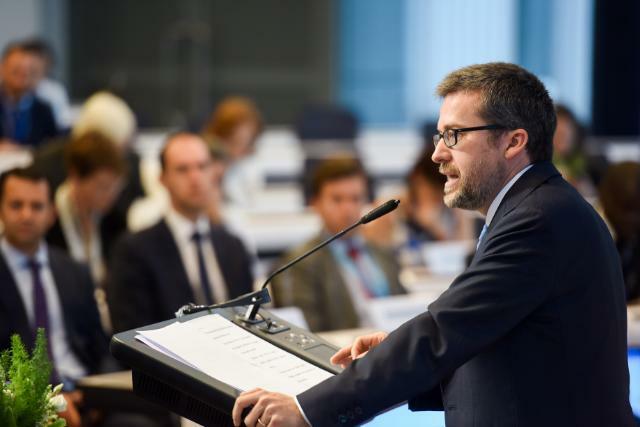 People no longer take science advice on trust, and science advisers need to provide evidence for their recommendations, according to Carlos Moedas, European Commissioner for Science, Research and Innovation. It comes as people are more and more able to access contradictory information at the touch of a button, and there is growing public mistrust of experts. Speaking at a conference about government science advice, entitled Science and Policy Making: towards a new dialogue, which took place on 29 and 30 September, Commissioner Moedas said that the public would only accept scientific advice if they understood the process by which it was collected and given. Later this month, the EU’s high-level group of scientific advisers, an expert group of seven independent scientists which was set up in late 2015 to provide advice to EU policymakers as part of its Scientific Advice Mechanism (SAM), is due to give its first recommendation. The group has been looking at ways to close the gap between light-duty vehicle CO2 emissions levels in laboratory testing and in real life. Commissioner Moedas said the most effective way to deliver science advice is to find the best expertise and explain it to people and politicians in a way that they can understand. Tibor Navracsics, European Commissioner for Education, Culture, Youth and Sport, told the conference that scientific advice is crucial not only to come up with solutions, but also to identify the problems in the first place. He said that politics is driven by values and finding the right balance between reason and emotion is becoming more difficult, but that scientists can help politicians by listening to what they need and providing relevant facts at the right time in ways that non-scientists can understand. Sir Peter Gluckman, chief scientific adviser to the prime minister of New Zealand and chair of the International Network for Government Science Advice (INGSA), pointed out that scientists are also operating in a far more complex environment than in the past. Mairead McGuiness, Vice-President of the European Parliament responsible for the science and technology options assessment (STOA) panel, who addressed the conference via video, said that scientists need to understand that policymakers won’t always rely on scientific advice. The conference, which was organised by the European Commission and INGSA, discussed how scientific advice could be brought into policymaking in a society that some commentators have described as ‘post-factual’. One example given of where public opinion is out of step with mainstream scientific advice is vaccinations. A recent study from Imperial College London, UK, shows that Europe is the most sceptical region in the world when it comes to vaccines and 41 % of people in France disagree with the statement that vaccines are safe, whereas the consensus among medical researchers is that they are safe. The European Parliament’s McGuiness said that it is important to push back against the idea of the so-called post-factual society. Robert-Jan Smits, Director-General for Research and Innovation, has been awarded the first EuroScience lifetime achievement award for science and society. Dr Peter Tindemans, secretary general of EuroScience, who presented the award at the science and policymaking conference, highlighted four areas where Smits had played a major role: engaging the European Investment Bank in science and innovation, strengthening the link with structural funds to create dynamic regions of knowledge, supporting the European Research Council, and keeping European research infrastructures on the agenda. EuroScience, a grassroots organisation set up in 1997 to be a voice for scientists, set up the awards to recognise individuals who have made a major impact on European science.